Carbonite is a backup application software that provides flexible data protection. It creates backups without affecting the performance of the system. This software gives a feature of unlimited cloud storage along with remote sharing facility that gives access to files from anywhere. Moreover, this software delivers unlimited protection and has a user-friendly interface that allows easy installation. This software has easy recovery options, using which lost data can be restored in minimum time. The free version of this software is available that allows the user to test services before finalizing the purchase. How much does Carbonite cost ? 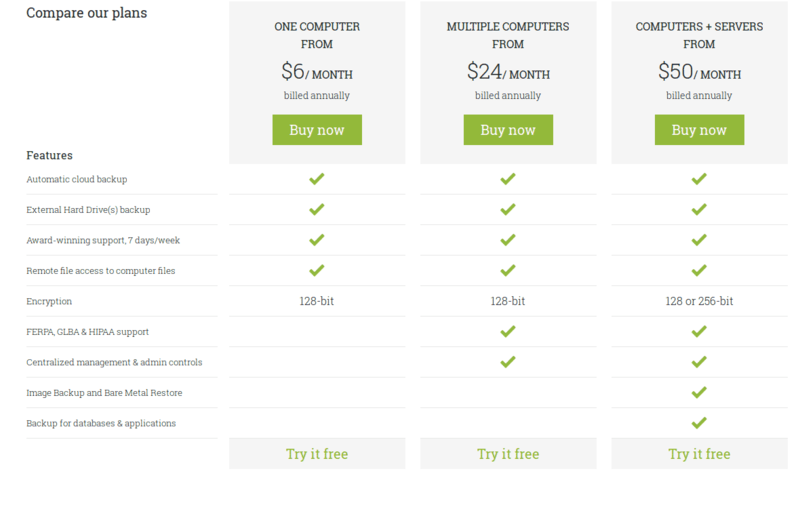 The pricing for Carbonite starts at $6.0 per month. Carbonite has 3 different plans such as - One Computer at $6.0 per month, Multiple Computers from at $24.0 per month and Computers Servers at $50.0 per month. Disclaimer: The pricing details were last updated on 04/04/2018 from the vendor website and may be different from actual. Please confirm with the vendor website before purchasing. Pros: Easy to set up. No need to bother with it after set up because it just does its job. Cons: No cons that I can see. It is simple to set up and adjust, if needed. Overall: Our back up system was less than desirable, and it failed often. Carbonite solved that problem and we can verify that back ups are done daily. Since we deal with a lot of information, it is critical that we always have a reliable back up in place. Pros: that it backs up my files on my computer? Cons: its does not work, the software stops working and does not back up my computer. the last time it backed up my computer was Oct 31 and it March 23. so I call support spend an hour trying to get them to reinstall the software. and the said i need a level 3 tech to do so. so they are going to call me back in the mean time the software is off line right now ... this is crazy. Pros: I have been using Carbonite for about 6 years. I find it very effective in keeping a continuous backup of my files as well as a means to access a file remotely when I am away from my office. It runs lightly in the background and doesn't not interfere with the performance of my computer. Cons: My only dislike about this software is when I have had to do a full restore of my computer it takes several days and needs some babysitting to be sure it continues the process. Overall: Overall I have been very happy with Carbonite and continue to use it for my backup system. Pros: When you make customer signs for a living and a computer glitch loses an image Carbonite restores your file instantly. Cons: I honestly can't think of one. The price is great too. Pros: The security of having my files automatically backing up to the cloud. Cons: Files aren't always uploaded as they exist on your computer. For instance, instead of files being in a folder, Carbonite sometimes uploads the folder (empty) and files individually. Very annoying. Overall: For the price, it's worth the piece of mind. Pros: Carbonite has been a great backup solution for our company. It has made it easy to restore data onto our users computers. Cons: I wish it was just a bit simpler for the end user to change their passwords. Overall: My overall experience with Carbonite has been satisfactory. Pros: I like the peace of mind that Carbonite provides, knowing that my files are constantly being backed up. I don't have to worry about losing one file should something go wrong at my workplace. Cons: Sometimes Carbonite loses its connection to the internet and sends a message that you have not backed up in X number of days/weeks. I have to reboot the server and this usually fixes the problem, but it can be annoying to have to do that. Pros: Once set up it is very easy to use. It will continue working in the background. Cons: Can have errors or quit working and the user not be aware. The bing that makes it nice, automatic hands off backup, also makes it a danger. You need to verify frequently that the software is doing its job. Overall: Quit working and customer service was unable to help me get it working again. Pros: The tool does exactly what you need it to do - back up your hard drive to the cloud with ease! Cons: None - software is fantastic and has saved me once during a hard drive failure! Pros: Love the business price for server and workstation backup, and how easy it is to setup and configure. This is the best price backup software I've seen, and it's still number one in my book. We have tried Mozy, Crash plan, etc, but Carbonite is by far the easier, and cost effective solution. Cons: Nothing really. This has been the software of choice we use in our office, and also recommend to clients that do not have already existing backup software. Overall: Easy setup, and very easy data restore as well from the cloud. Was able to browse the file I wished to restore on my mobile phone. Is there any trial version available for any of this backup software? Yes. 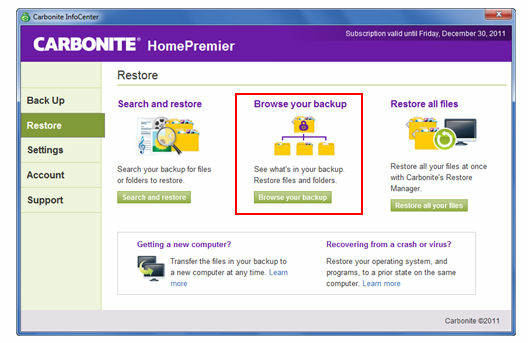 The trial version is available for Carbonite backup software. Which software can be preferred to get unlimited storage space? You can pick Carbonite or Backblaze as both of this software provides unlimited storage.